Last years Yeovilton Air Day was considered 'show of the year' for many enthusiasts, leaving this year a lot to live up to. But after being hit with masses of cancellations in the run up to this years show, would it be able to maintain its reputation? Peter Reoch reports on the Royal Navy's showpiece event. Photography by the author and Trevor Reoch. In the run up to the show, it seemed like the organisers seemed to be cursed with the worst of luck, with early cancellations of the Vulcan and Sea Vixen due to un-serviceability. 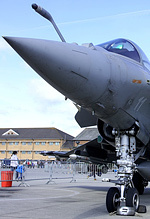 A double blow came when the promised Rafale pair and NH90 solo displays from the French Navy were both cancelled. Then the Red Star Rebels - who were due to debut at the show - were unable to attend due to 'paperwork issues' with the CAA and the Kennet Skyraider which was due to display was reduced to static only on show day. 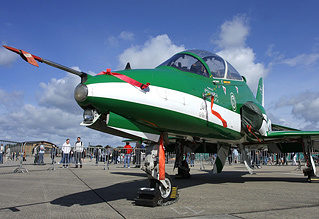 A clash with Florennes airshow also meant many of the European air arms were unavailable, leaving a distinct lack of afterburning jets for the show. Even looking at the show with a pessimistic viewpoint, it was hard to miss some of the major coups for the show. The Saudi Hawks began their short "goodwill tour" of the UK at Yeovilton, and one of the spare Hawks and a lovely Hercules in sand camouflage scheme were both available for closer inspection in the static park. The rarest item in the flying display was an Antonov AN124, operating on a MoD charter flight from Brize Norton which completed two spirited flypasts and remarkably tight turns, a real treat for the crowd. What Yeovilton seems to have as an advantage over other shows is the organisers "can do attitude" regarding unique moments for the show. A Mustang/Skyraider/Sea Fury formation was due for the show, on the day it turned to a Kittyhawk/Sea Fury formation - but no less impressive or pleasing. 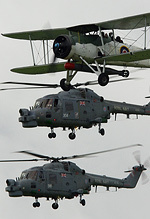 The RNHF Swordfish was escorted into it's display by four Lynx, it's these simple formations that makes Air Day extra special and the organisers should be commended for such efforts. Another added extra to the show was the departure of the AW159 Wildcat (was on static display in the VIP area) during the flying display. The aircraft hover taxied in front of the crowd, before a 360 turn at crowd centre and continuing onwards to its base at Yeovil. Support for the Navy was strong from both the RAF and Army. The Army Air Corps provided a Lynx AH7 solo display for one of only a handful of appearances this year and also an Apache AH1 for the Commando Assault finale. The RAF - constantly referred to as the "junior service" all day in typical tri-service banter - provided the Tornado GR4 role demonstration, Red Arrows as well as the Tucano and Hawk solo displays, with the 2012 Hawk making it's first appearance in the UK in the new display colour scheme. Other notable items in the flying display included aircraft from Classic Aircraft Trust, the first display appearance of the Hunter T7 "FireFox" in its new - and it seems temporary - Jubilee paint scheme, Gerald Cooper in his SBACH 300 and a pairs display from a Yak-52 and Soko Kraguj. It's fair to say that while Yeovilton lacked in the 'heavy metal' department, the flying display that the show did have was still of a high quality and varied to cater for a vast audience. The static also was much larger than previous years. The show celebrated the 30th anniversary for the Falklands War with a line up of Sea Harriers, Wasp, Lynx and Argentinian Huey in the static display. Another welcome addition to the static was a USAFE HH-60G Pavehawk from Lakenheath, the aircraft which deservedly won the award from the show for the best static aircraft display. The friendly American crew were quick to remove the barriers and show members of the public around the aircraft and the assortment of equipment they had on display. I think it's awful to see an aircraft 'dumped' in the static display for the weekend at an airshow, with no crew in sight. The levels of commitment from many aircrew who take the time to firstly fly the aircraft to an airshow for us to enjoy and then interact with the public and show off the equipment to inspire the aviators of the future should be highly commended. A Yeovilton Air Day wouldn't be completed without the role demonstrations from the home team. Both the Lynx role demonstration and the Commando Assault finale focus on similar simple principles; multiple aircraft, loads of action, plenty of pyrotechnics and a liberal dosing of flares thrown into the mix and you've got the recipe for awesome demonstrations. 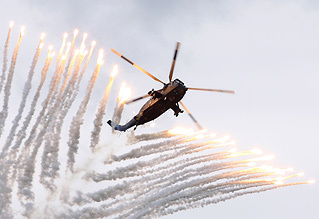 The way the crowd surges forward during the finale as Sea Kings deliver troops to the battlefield, Hawks bomb the enemy and the Apache and Lynx AH7 provide air support, shows how popular the set piece is with the public. I doubt you could find anyone who would fail to be amazed and delighted by the spectacle of the Commando Assault Finale. I think it's this that sets Yeovilton out from any other show, personally I'd pay the ticket price for the Naval set pieces alone. I think everyone would agree that Air Day 2012 didn't match the quality of show that we saw last year, but it wasn't a bad show at any rate. The organisers were unfortunate with the number of cancellations and I have no doubt that if the Rafale pair, NH90, Sea Vixen and Red Star Rebels had all appeared we would have had a very different outcome. But I suppose that's how airshows are rated this year, with so much competition in the market it often does come down to the participation of the "star items" that sets a show out from the others. Onwards and upwards for Yeovilton 2013!